Kenneth Maes is a medical anthropologist interested in links between health workers, health policy, and health outcomes. He is particularly interested in how community health workers in different times and places shape the well-being and health of their own communities, how global health institutions and local communities negotiate the quantity and quality of available community health worker jobs, and how health workers, policy makers, payers, and others build solidarity and shared goals. 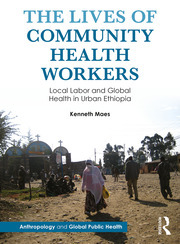 Since 2006, Kenneth Maes' research has focused on community health workers (CHWs) in Ethiopia. Using data from surveys, participant observation, and in-depth interviews, he and his colleagues have shown that people become CHWs partly because they seek to uphold values of humble service to others in need. But people also hope that becoming a CHW will help them achieve freedom from economic insecurity within their own households. The research he conducted in Ethiopia's capital, Addis Ababa, during the 2007-8 global food crisis revealed that many CHWs experience moderate to severe household food insecurity, and that food insecurity is strongly associated with increased levels of psychological distress. From 2012 to 2016 he was Co-Principal Investigator (with Svea Closser, Middlebury College) on a research project funded by the National Science Foundation, focusing on Ethiopia's rural cadres of paid and unpaid CHWs, known as Health Extension Workers and Women's Development Army leaders, respectively. This project also focused on the well-being of the health workers themselves, and their relationships with the communities they serve and the global institutions that rely on them. Most recently, he has become an active member of the Oregon Community Health Worker Consortium, serving on the Research Team to advance understandings of CHWs and the challenges they face in Oregon (USA). Prior to joining Oregon State University, Maes was a postdoctoral fellow at Brown University’s Population Studies & Training Center, an interdisciplinary demography center specializing in the study of population, health and development. For a list of his publications, please see his Google Scholar page.